Admist some technical challenges (spotty internet), systemic problems (we got trotted out of the CNE tent for 30 minutes for a security sweep) and competing demands (ocassional live spots with AJE) we are going to do our best between Geoff Ramsey, Hugo Pérez and myself to live blog the next couple of hours, as we wait for results. 2:00 DS: One final comment. Kudos to President Maduro and Chavismo for recognizing the results. We shall see what kind of political learning this generates, hopefully constructive. But whatever the case, they deserve praise for going headlong into elections that all polls said they were going to lose, and accepting the results with integrity. Remember for a moment how many people over the past year said there would be no elections, that the numbers would be cooked, or that the government would not recognize adverse results. In hindsight, all those comments by Chavistas this evening, during the hours before we knew the results but long after everyone knew the tendency, talking about how admirable the democratic process had been, look truly admirable and democratic. 1:05 DS: One knowledgeable expert suggests to me that some of these 22 are districts where machines failed and there was manual voting and therefore the results do not arrive the same day to CNE headquarters. He suggests that the result will be between 108-113 and that the result cannot be tampered with at this point. Maduro on television suggests that they need to radicalize the revolution. Doesn’t seem like a constructive reading of these results. 12:42 GR: The CNE has issued the preliminary irreversible results: the MUD has gained at least 99 out of 167 seats in the National Assembly. This means it will obtain at least a simple majority. President Maduro speaking on national cadena now, recognizing the results and comparing it to previous setbacks in the history of Chavismo. 12:00 DS: The word around the journalist’s tent at the CNE is that the delay is about damage control and the government trying to figure out how to respond. There is no way the result can be changed at this point. 11:35 GR: As we wait for the poll results, it’s worth taking a step back and remembering how historic this moment truly is. Today, millions of Venezuelans participated in the first elections in fifteen years in which the ruling Chavista coalition is expected to lose its legislative majority. Below, teacher Ginette Perez and Chacao, Caracas resident “Carlos” discuss their different views about the government/opposition, and their hopes for the outcome of the elections. 11:20 DS: The opposition’s taking a two thirds majority would be an absolutely brutal result of the Maduro government. Apart from the significant power it would give the opposition, it would be a significant symbolic rebuke that would limit national and international tolerance for really undemocratic responses. 11:15 HP: Not one government oficial has shown up at the VTV studio for the last two hours. 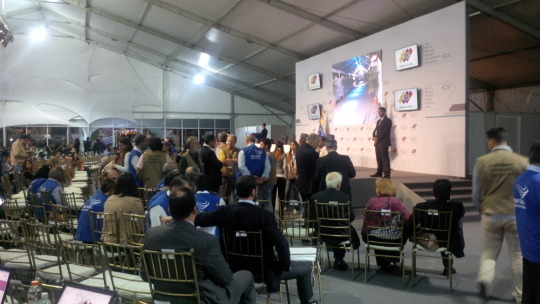 11:00 DS: Tweets from Eugenio Martinez @puzkas, Venezuela’s leading elections jounrnalist. Given the restrictions on advancing numbers before the CNE’s official announcement, he decided to tweet about his favorite soccer team. 10:50 GR: One of the most interesting questions to come out of the results of tonight’s elections, however they go, is definitely whether the 2015-2020 National Assembly will see more dialogue and compromise on inflation, scarcity, and other key issues. David’s take on this is definitely worth sharing. 10:25 DS: Most rumors now talking about an ample MUD win. Check our post below for the different attributes of a simple, 3/5ths and 2/3rds majority. 10:05 HP: VTV has just played a clip showing an example of how a opposition controlled congress can be used by “neoliberals” to impose measures, the example is Greece. Now comes a second clip with a second example: Portugal. 10:00 DS: Looking at the social media rumors Padrino López mentions there is a pretty clear tendency. Many very happy and triumphant opposition tweets and blog posts. What Chavista tweets there are talk about the integrity of the process and how democratic it was, etc. not about the results. 9:49 GR: I spoke with people at Caracas voting centers in La Florida, Chapellin, Chacao, Bellas Artes, and Petare today, and I have to say that what struck me more than anything is how routine many people saw today. While some international analysts are following today with bated breath, for plenty of Venezuelans this is a routine civic exercise, like many others past. 9:10 DS: I’ve seen preliminary results from a number of sources, the credibility of which are hard to determine. All of them indicate a simple majority for the opposition. But most numbers are from 4 or 5 pm in the afternoon. Many polling centers were open until 8 pm. 9:00 pm, HP: Now in VTV Dario Vivas speaking about how clean and fair are elections in Venezuela. No one in VTV speaks of triumph, they all speak of democracy and participation. 8:45 pm, DS: Here in the CNE waiting for results. The most important movement so far is that Sandra Oblitas announced a one hour extension of the closing of electoral centers. About 10-15 minutes later the one opposition rector of the CNE Luis Emillio Rondón came in and said he thought the extension was illegal and that it was entirely unnecessary given that all electoral centers have to stay open anyway, if there are people in line still. These extensions are controversial because the opposition accuses the government of using privileged information on who has voted, for targeted voter mobilization, something referred to as “Operación Remolque.” It is not clear that this is what actually happens, but it is clearly controversial and the CNE should not take this lightly.